What is it? GFS (Genome-based Peptide Fingerprint Scanning) predicts the genomic origins of proteins by scanning their peptide-mass fingerprints against an entire genome, subjected to translation and trypsin digest in silico. 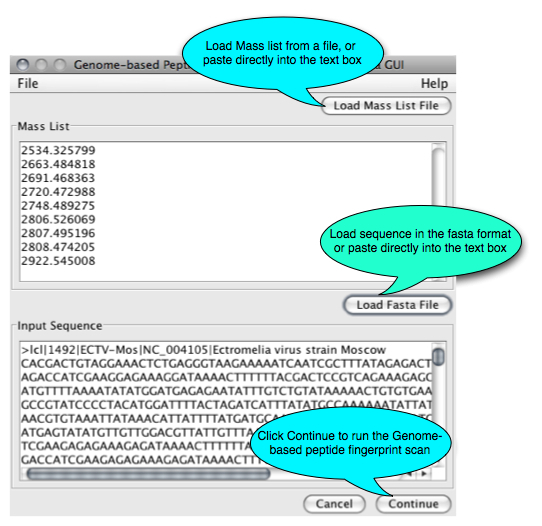 The program uses the experimentally obtained peptide-mass fingerprint as input, and outputs the most likely regions of the genome from which the mass fingerprint is derived. The GFS method was developed by The Giddings lab at Chapel Hill, University of North Carolina. The Upton lab developed the JAVA interface and integrated it into the VOCS and VGO programs. 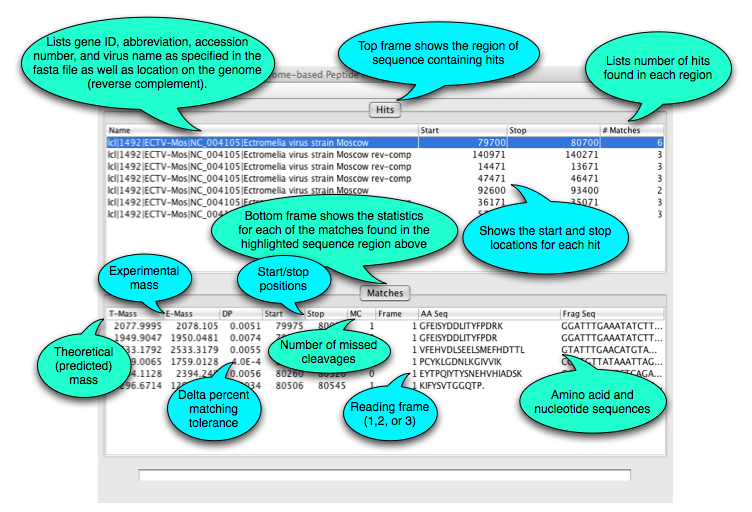 The advantages of GFSJ are: it’s extremely fast; it doesn’t depend on ORF/gene annotations; it’s free and open-source; it’s built into VOCs and VGO tools for quick and easy analysis of viral genomes; runs on Mac OS X, Linux and Windows; batch processing available. How do I get started? GFS can be accessed for free at www.virology.ca, available as a stand-alone program or from menus inVOCs and VGO. Select GFS from the VBRC Tools drop-down menu (top left of the page) or Click here to go directly to the GFS page. Click the Launch Program button. GFS will be downloaded to your computer and Java Web Start will automatically start the program. What next? The main GFS window below will appear. From here you can paste or upload peptide-mass fingerprints, and genome sequences for analysis.